Einstein said that Imagination is more powerful than knowledge. When you are able to imagine the life you desire to live, you are tapping into the most powerful resources of your mind that is connecting to infinite intelligence. In the movie, Miracle On 34th Street, Chris Kringle was explaining to little Natalie how there is a French nation, and British nation and an Imagine Nation. To get there, you only need to play and let your self dream of anything your heart desires. Imagination has infinite possibilities. 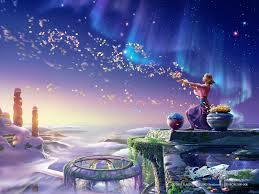 These magical days of this season, allow yourself to dream lofty dreams, and visit the Imagine Nation often. The world is in need of people who can Imagine. Imagine peace on earth. What would it look like and feel like? If enough people can visit this place together, we can create it. Wishing everyone a Joyous Christmas, and Happy Chanukah. This entry was posted on Tuesday, December 23rd, 2014 at 1:07 pm and is filed under Art of Thinking. You can follow any responses to this entry through the RSS 2.0 feed. You can leave a response, or trackback from your own site.